With a highly diverse economy, a rush of people and jobs, and a river of relocating corporations flowing in, Dallas-Fort Worth is riding high in the saddle of prosperity and growth. But the region lags behind many of its U.S. peers in education levels and, surprisingly, innovation and entrepreneurship, raising questions about how long DFW can continue its economic gallop and what infrastructure and workforce weaknesses threaten to slow DFW down. Texas has become an important part of the realigned North American “auto alley,” now running north from Mexico through a number of southern U.S. states, to the Midwest rust belt. The traditional U.S. auto corridor radiating from Detroit has rapidly shifted toward the U.S. South since the 1980s. Monterrey-San Antonio-Arlington ---- there's something about this line-up, like, manufacturing big stuff (like cars) is going to be a bigger deal in the future than it already is. It's funny to think politics can answer simple questions, ha ha ha, but it really seems like this corridor, The I-35 Corridor, The NAFTA Superhighway, whatever, could take on an entirely new role in global trade if the Texans and the Mexicans considered the stretch as one entity. Such a trap to bring it up yikes! DFW boasts some of the greatest momentum in the country when it comes to high-tech job growth, a new study has found. The area’s growth rate for high-tech jobs increased from 10.8 percent during the 2012-2014 period to 19.7 percent in 2013-2015, according to CBRE’s Tech Thirty report. Only two other markets – Toronto and Charlotte – saw a higher percentage-point increase. Overall, about 93,000 people are employed in high-tech software and services jobs in DFW. The tech workforce is more than twice the size of Austin’s, CBRE noted. Dallas-Plano-Irving is one of the best metro areas for economic growth, according to the 2016 Milken Institute Best-Performing Cities. The area ranks No. 5 in the country out of 200 large metros examined, the same rank it had last year. The study broke up the DFW metro area, as it ranked Fort Worth-Arlington No. 42 in the country, down 11 spots from last year. Dallas and Austin are still riding “a wave of corporate and regional headquarters relocations” as the two cities have accounted for three-quarters of new jobs created in Texas this past year, Wells Fargo Senior Economist Mark Vitner said in a report Friday. “There is no apparent let-up,” Vitner wrote. Makes you wonder how many boats the labor pool can float. Where are the warehouse areas that helped D-FW set leasing and construction records? ...net leasing of Dallas-Fort Worth industrial buildings set a record...Over 25 million square feet of net warehouse and industrial leasing...2.6 million square feet more than the previous record warehouse year, 1999. The biggest share of growth was in southern Dallas County, where developers and building owners saw 5.5 million square feet of net leasing. North Fort Worth had the second-highest industrial growth with 5.4 million square feet of net leasing. Many of my innovative friends and colleagues are trying to figure out whether or not visas and Green Cards matter anymore. Yeah, growth is going to be huge on the current track. While none of the prospects has moved from chatter to reality, the discussion alone has captured the attention of the North Texas business community, which sends about $5 billion in goods and services to Mexico ... Luisa M. del Rosal ... noted that talk of the wall has sparked angst in Mexico, in part because it's linked to a larger discussion about the fate of NAFTA. NAFTA probably does need some tweaking, but here's a dealio where the politics of money has direct, immediate impact on North Texas. President Donald Trump’s early promises to aggressively renegotiate U.S. trade deals and his threats of imposing higher taxes on imports have been carried out during his first month in office in the name of creating more jobs. But it may come at a significant cost to certain cities. Dallas’ blossoming export businesses and an estimated 324,000 local workers who depend on the flow of goods to and from the U.S. could be jeopardized if other countries retaliate, according to a recent study by the Brookings Institute. Trump has withdrawn from the Trans-Pacific Partnership ... He has threatened to tear up the North American Free Trade Agreement and charge higher tariffs on imports from Mexico to build a wall along the southern border. Such a move would very likely lead to retaliatory taxes charged on U.S. exports into the country. More than 13 percent of Texas’ economy depends on exports ... increasing by 5.6 percent per year ... The Dallas-Fort Worth area was the fifth largest exporter in the country, shipping $59 billion worth of goods and services outside the U.S. in 2015 ... Mexico in particular is Texas’ largest trade partner. Since publishing its research last week, Brookings has heard more from local businesses and chapters from Wyoming to Iowa than from policy makers in Washington, D.C. so far, Parilla said. “They are responding by saying, look, despite the clear and, at times, justifiable frustration with globalization, the answer is not closing the door to trade,” Parilla said. It may be a decade before revised trade agreements allow growth and more open exchange between North Texas and many Pacific Rim countries, but clearly a good relationship between Mexico and Texas is beneficial and critical. For 30 years, Texas has been on the winning side of history, getting downright rich off the global trading system that arose after the Cold War. Now, that wealth is about to be taken away in one of the greatest smash-and-grabs in U.S. history ... The border tax would transfer an estimated $1 trillion from corporations that import goods and services, namely in the big trading and border states, and Texas is at the top of that list. This wealth would then be divided between government in Washington and legacy manufacturers, largely clustered in the less competitive American Midwest. It is the riskiest gambit with the American economy since the tariffs that triggered the Great Depression. All of this may explain the sudden hesitation of a few Texas Republicans. After lining up with Trump the candidate, Texas Rep. Will Hurd has broken sharply with Trump the president over the border wall. So has Republican Sen. John Cornyn, the Senate majority whip, who has said it "makes absolutely no sense." As for the border tax, Cornyn has said, "It's time to look for other options." The Koch brothers and Steve Forbes have weighed in against the border tax. And the governor and lieutenant governor here in Austin? Not a word from the former, and the latter simply downplayed it as, well, Trump being Trump again. I should expect the full congressional delegate from Texas to fight the border tax. The commentary is of course something of the same protectionist mentality looking to prop-up the Midwesterners. A recent boom in building has pushed Dallas-Fort Worth to the second-largest data center market in the country. Only Northern Virginia has more of the high-tech data facilities, according to a report by commercial real estate firm CBRE. In 2016, new projects increased D-FW data center space more than 25 percent to a total capacity of 208 megawatts, the study shows. Only about 5-7ish years ago, The Metroplex data center rank listed in the teens(?) moving toward the top 10, now Dallas-CoCo is #2, interesting. Less expensive construction/facility cost, less expensive electricity and above average grid reliability are among the region's advantages. Power is power, and the power grid in Texas needs to be fortified, made even more reliable, and less expensive. Sure would be nice to see increased electricity from solar farms feeding the Texas grid along the lines we've seen from wind. City populations will be the early adopters of new technology in personal vehicles, so encourage more electric vehicles by continued facilitation of cleaner electricity generation -- couple solar and wind for night and day power generation and keep the transmission line capacity growth ahead of power growth. Not only will the power component continue data center development, but far more significantly, adding above average air quality to advantages of it's cities, the state can improve the appeal of Texas Triangle cities for people and entities studying Sunbelt population centers for relocation. I thought this was kind of interesting, it sort of confirms lots of assumptions about the type of product going up in DFW, in relation to size and development costs, and profitability. It's part of a presentation for 'corporate housing' or stealth multifamily, and possibly a look at the future of apartment communities. Developing and building a multi-family project in many key markets is nearly impossible. As multi-family supply has increased, it has become more difficult to find 10-20 acre sites that are zoned accordingly. If a (large enough) site is available, municipalities are reluctant to rezone to multi-family. This will definitely be a challenge. There is a lot of NIMBY attitude around such developments. A recent project here in Las Colinas had all kinds of stipulations put in to ensure the building (adjacent to new proton therapy center) couldn't be used as a form of apartment. But I agree that such a configuration should work well in more urban neighborhoods. This tweet has a listing of downtown employment corridors. Here's the ones for TX, including two for Dallas with some (surprising to me) results. Not sure how this data was tabulated. #13 Austin - 214,865 jobs in 1 sq mile - 66,843 population in 1 sq mile. 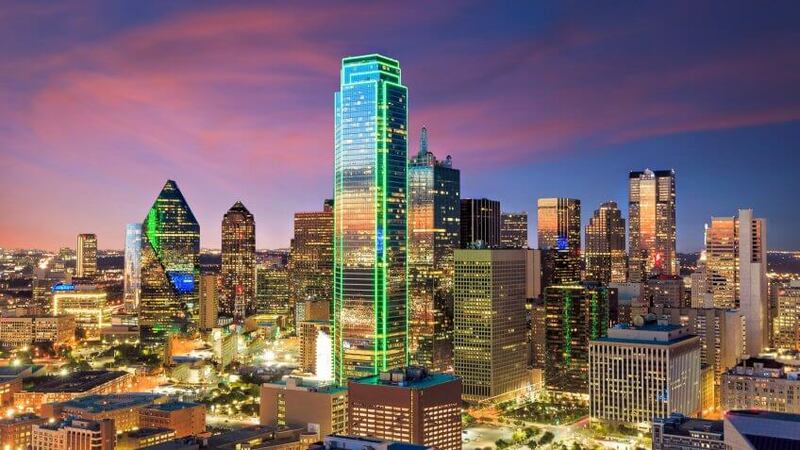 #19 Dallas - 167,514 jobs - 36,884 population. The expected cities lead the Texas cities (NYC, LA, SF, Chicago, DC), with some you might not think of in the Las Vegas strip with twice as many jobs and population as downtown Dallas, and Irvine CA, and Minneapolis. Dallas, Houston, Pittsburgh, and Atlanta are serious population laggards compared to jobs. Downtown Dallas' population of 36,000 was the lowest on the list by far. ^That's one reason 'this cycle' of residential construction in the downtown area is no where near an end or pause. Tivo_Kenevil wrote: From the report ..
How long is really left before the building binge runs out of steam? "I ask myself that every day," says Dallas developer Craig Hall, who's breaking ground this week on a $250 million downtown project. "I've never seen anything like this. "I have no idea how long it's going to last and it worries me. My guess is we are probably a few years away." And Batt couldn’t be happier to be located in DFW. “This area – the hair on the back of my neck stands up,” he said. “It’s potentially bigger than the Bay Area for this one reason: there’s no land lock. Batt said that one of the reasons FPX has set up shop in DFW is that he believes Dallas could be the next big thing for the tech market. Interesting perspective...But I couldn't read the whole story...so I'm not sure what else the former CEO said ..But I certainly don't think Land Area is a primary factor in Tech Growth...The thing with Tech Companies/ Start ups is that many of them are born in / around top universities. And that's the thing, DFW doesn't have a top tier University like a Standford and or a UC Berkeley. That's the biggest difference IMO. Being Land locked certainly hasn't stopped the Bay Area growth in Tech.. it just means these companies go further out from the Bay and sometimes out of the state once they're established. But overall, they start there because of the Tech Culture , top universities (talent) and the VC's in the Bay area. Will DFW ever be the Tech epicenter like the Bay Area?... I doubt it. When many VC's start coming setting up shop then I'll believe the hype. Get VC's and invest in your local universities and companies will follow. Texas' fourth quarter 2016 GDP growth was good, although the whole Southern half of the country west of Atlanta and east of Phoenix was quite low for the year. The BEA will not release 2016 GDP growth estimates at the metropolitan level until September. Singapore has the highest biodiversity of any city in the world. The Gardens by the Bay consist of forest environments created within buildings and in open spaces in the city – including ‘Supertree Grove’ below. Clean the air & water & land, keep the natural environment close and find a way to share the built environment with all indigenous species, otherwise DFW will top-out and begin to assume a similar roll and function as St Louis, Kansas City, Memphis, Cleveland.... all once leading the charge, but now in the middle. It is not D-FW of which Forbes speaks, however, but DPI (Dallas, Plano and Irving), ranking the area ahead of metro areas in San Francisco, Nashville, Charlotte and Orlando in its 2017 Best Cities For Jobs listing. "Unlike the tech-driven Bay Area, Dallas' economy has multiple points of strength, including aerospace and defense, insurance, financial services, life sciences, data processing and transportation," the magazine said in its report. In other words....its the wedge. What's funny is that despite all this momentum...we are starting to show signs of have a housing shortage just like SF..which means skyrocketing rents. I literally just read on DMN that this past April was the highest for rent ever for NTX. There was an interesting piece on NBC local news yesterday about the mass shortage of construction workers in DFW. I don't have the link handy, but essentially we are 20k short of construction workers and this is causing numerous project delays and costs to sore. At one point they were talking to contractors who said a big problem is that they'll have competing contractors come in and swoop up their workers while on site by offering a couple bucks more an hour. Apparently it's become a big problem. I wouldn't be surprised if this is the reason we see so many projects that seem like no-brainers getting delayed over and over again. muncien wrote: There was an interesting piece on NBC local news yesterday about the mass shortage of construction workers in DFW. I don't have the link handy, but essentially we are 20k short of construction workers and this is causing numerous project delays and costs to sore. I have seen this first hand in two projects. It is a workers world right now so if any employer delays paying its workers in cash/check etc workers have plenty of options to jump ship and earn some money on a newer project. What many people forget is that construction workers are paid far differently than white collar and other upper-level jobs. There is limited to no employment contract and they get paid weekly in many cases so it's easy to jump ship to another job site. Very interesting. I kinda felt like the amount of new buildings getting underway was less than expected, but I don't have any hard numbers to know how true that actually is. I also thought maybe it was a case of people not wanting to over-build, so they are letting current buildings wrap up and get leased out, before announcing a slew of new ones. Bad news for FW, energy has really clobbered that side of the metro. As far as I'm concerned, the socio-economic impact of fracking causes socio-economic cancer. Dallas is second in the nation in hotel rooms under construction, second only to NYC. In May 2017 the year-over-year increase in hotel room construction for Dallas is a whopping 55.4% to 7,503 hotel rooms currently underway! Interesting that Chicago is the one city that is seeing a drop. Tnexster wrote: Interesting that Chicago is the one city that is seeing a drop. Probably a symptomatic sign of larger problems for Chicago in particular and Illinois in general. Chicago was the only top 10 city to lose population in the most recent census bureau population estimates. The luster seems to be coming off the Windy City ... and Illinois as a whole. The State of Illinois is actually teetering on the edge of bankruptcy. North Texas got at least couple noteworthy companies from Detroit (and a criminal ex-mayor); I wonder what'll come from Chicago. You mean for the midwest in general. Chicago may have been the largest city losing population, but St Louis, Detroit, Toledo, Milwaukee, Cleveland, and Milwaukee all lost population, and Cincinnati gained like 100 people. The only major midwestern city that seems to be doing ok is Minneapolis. Dallas could be emerging as a surprise fit for companies that need software developers, as the talent-starved tech industry looks outside its traditional and increasingly picked-over hubs, according to JLL. The research firm released a report this week on where to find tech talent. Dallas-Fort Worth ranks as the market with the fourth-most computer programmers and the eighth-most software developers. JLL says the market’s 38,000 software developers warrants consideration from corporations looking to relocate, as developers in particular have become more and more of a hot commodity in recent years. How are the three North Texas Tier One university candidates doing, UNT, UTA & UTD? Although research spending is a primary threshold of the Tier One label, delivering computer programmers and developers should certainly be a mandate. Dallas earns the strongest marks and ranks numero uno in the nation in 2017 as the top metro for the attraction of skilled talent. More and more recent surveys and indices are showing Dallas as either the leader or a top leader in so many of the most desirable categories that are drivers of economic growth - which is the foundation for all sorts of positive things such as growth in high-paying jobs, population, and construction including the forest of towers sprouting in Dallas' core. Houston and Austin appear on the list at numbers 4 and 5 respectively but Dallas is knocking it out of the ballpark! "Dallas-Fort Worth-Arlington ranks as the top metro for talent attraction based on its strong growth in jobs, migration, and educational attainment. The metroplex is closely followed by Denver-Aurora-Lakewood and San Francisco-Oakland-Hayward. Dallas, Denver, and San Francisco are hubs for skilled talent, both in their city cores and surrounding suburbs. But they’re not the only talent magnets. The top 15 includes Austin, Seattle, Portland, Tampa–and yes, Phoenix (No. 10) and Las Vegas (No. 11)." ^These the same population centers that show up on economic growth charts, graphs, lists and indexes all the time... I don't mean to diminish the accomplishments, DFW has been top ten, top five for decades and there's nothing on the 50 year horizon indicating things will change --- that's the same for most of the metros on that list. To truly become set apart, stand alone from this group and step up to the next group the region will need something more. Improved quality of life, expanding the appeal of cultural and entertainment activities, aspiring educational opportunities from Kindergarten to Doctoral programs. I'm super good, but I'll get better. I guess you're engaging in some hyper-cheerleading but you do realize the post I made had Dallas at Number One ... being Number One is generally considered "at the top". Yes, Dallas has been in the top five or top ten in many key measurements for a very long time ... but being Number One is in a class by itself! And in the last couple of years that is the ranking that Dallas is achieving consistently ... if not number one then second only to someone like NYC. Due to its sheer physical size NYC tends to dominate any list. But again as of the last couple of years Dallas has even been topping NYC in many indices. Keep up the good cheerleading, though, because there is always room to do even better! No other city in Texas even made the top twenty much less had multiple cities in a single region as did Dallas. If we're not too jaded to appreciate this tidbit it shows just how vibrant and robust Dallas and the Dallas metro is.